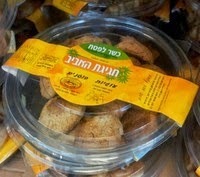 Kosherfrugal.com - Frugal Living in Israel: Mislabeled Cookies! This recall is SUPER important for people who are allergic to peanuts. Packages of Peanut Cookies for Pesach were mislabeled as Coconut Cookies for Pesach. The product in question is produced by "Tvuot Bar Mazon" and the affected product are their "Chagigat Ha'Aviv Peanut Cookies" in 400g containers, with an expiration date of 21.09.2014. Some are mislabeled as "Chagigat Ha'Aviv Coconut Cookies." If you've purchased a package of these cookies, thinking they are coconut cookies, they may in fact be peanut cookies. The product is being recalled, but consumers who have purchased these cookies can return them to the store where purchased for a refund, and can call 03-906-8621 with any questions. If you haven't already, please like my Facebook page so you don't miss out on more updates!